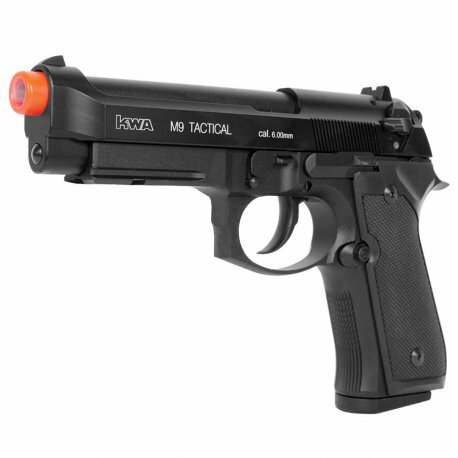 The KWA M9 PTP Tactical is the perfect pistol for any operator. The M9 is the current US military issue sidearm for all soldiers, proving it's excellence on the field. The KWA M9 PTP Tactical features an ambidextrous safety which allows both left and right handed users to effectively use the gun. Operators will appreciate the picatinny rail built into the bottom of the KWA M9 PTP Tactical, allowing them to attach a wide variety of tactical accessories including flashlights and laser systems! Realism is an important factor when it comes to Airsoft. The KWA M9 PTP Tactical features a full metal slide and body, giving you not only the look of an M9, but also the feel. Note: The KWA M9 PTP Tactical Airsoft Pistol has an orange tip.